Bugle: While in England, we did a favor for a musician friend of ours and as a "thank you" he gave us a bugle. Young Diva was thrilled. Have you ever heard?...nevermind...you can imagine what a novice bugler sounds like...it's not pretty. Thanks John. Trombone: We were(are) good friends with the owner of the music shop in town and Engineer was playing semi-professionally at the time in England. I happened to be in the shop one day and an older gentleman walked in wanting to sell his trombone. He had played professionally for many years and decided that he was through. It was a pretty little silver horn with some inscriptions and filigree work and as soon as he left, I bought it for Engineer's birthday present. Now knowing nothing about brass instruments, I didn't realize that it needed a little work and that it wasn't the kind of trombone Engineer would be asked to use. Basically, the trombone was useless to him but he was gracious and kept it anyway. Fast forward many years to this month's super-purge decluttering extravaganza where the need for the bugle and trombone came up. We agreed that it was too bad we couldn't use them but we didn't need them. What we did need and could use though was a lamp or two. It was a lightbulb moment...literally! Engineer did a little research (lucky for me, my Father-in-law is an electrical engineer) and found the best way to turn our surplus instruments into lamps. 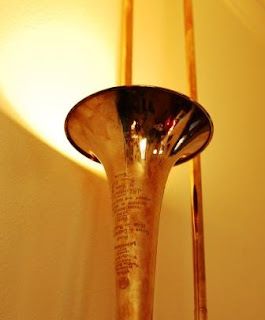 I am madly in love with my Engineer because he didn't think I was crazy for saying, "Hey, let's turn this trombone/bugle into a lamp!" Then actually made it a reality. Trash to treasure repurposing at its best. That is absolutely brilliant! I am a huge fan of turning so-called junk or extra stuff into something useful! Thanks Ms. McAfee! And thank you for stopping by! Hubby is working on the bugle lamp but it is proving a little more difficult due to its shape. He is trying to not render the instruments unusable. Let me know when you do the lamp Ms. Judy, I would love to see it. Oh wow! This is so creative! I'd love to have something similar in my house. I have so many things that I don't know what to do with, now I can repurpose into something else. Great! That's amazing and such a great idea. I love upcycling things and if I never get around to getting my clarinet fixed back up I may do something similar. Thank you so much for sharing! 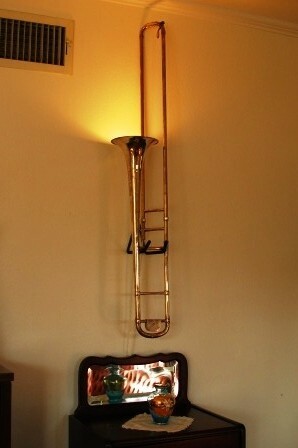 Oh a clarinet lamp would be great! Thanks for stopping by Ms. Myra!